The acromioclavicular (AC) joint is a joint that is situated near the shoulder. It is the junction between the acromion (part of the shoulder that forms the highest point of the shoulder) and the clavicle. It is held together by ligaments. It is a strong joint but its location also makes it vulnerable to trauma. Acromioclavicular joint injury occurs usually due to an extreme or blunt force to the shoulder (mostly heavy falls) or as a result of shoulder overuse. The true incidence is unknown as many individuals who are affected do not seek treatment. 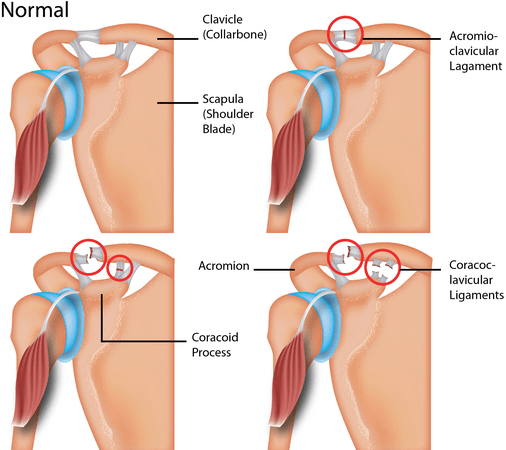 However, it was found that 12% of all dislocations involving the shoulder affect the acromioclavicular joint injury. AC (acromioclavicular) joint injuries are often seen in traffic accidents and sports such as rugby and football. It occurs most commonly in active young adults. Pediatric AC injury also on the rise due to the increasing popularity of sports. Males are also more commonly affected compared to females with a ratio of approximately 5:1. Younger individuals especially those younger than 35 years old also tend to sustain more AC injuries, primarily due to their greater participation in high-risk activities. Type I: minor sprain or partial tear of AC ligaments, intact joint capsule, intact coracoclavicular ligament, intact deltoid and trapezius. Type II: rupture of the acromioclavicular joint and joint capsule, sprain of the coracoclavicular ligament with intact coracoclavicular interspace, the minimal detachment of the deltoid and trapezius. Type III: rupture of the acromioclavicular ligament, joint capsule, a coracoclavicular ligament; elevated clavicle (<100% displacement); detachment of the deltoid and trapezius. Type IV: Rupture of the acromioclavicular ligament, joint capsule, and coracoclavicular ligament; posteriorly displaced clavicle into the trapezius; detachment of the deltoid and trapezius. Type V: Rupture of the acromioclavicular ligament, joint capsule, and coracoclavicular ligament; elevated clavicle (>100% displacement); detachment of the deltoid and trapezius. Type VI: this is usually rare and involves the rupturing of the acromioclavicular ligament, coracoclavicular ligament, and joint capsule. The clavicle is then dislodged behind the bicep tendons. Type II: Partial tear of the periosteal tube, allowing for some mobility of the distal clavicle; disrupted acromioclavicular ligament. Type III-IV: Larger tear along the periosteal tube which allows for a greater clavicle instability and positioning; the coracoclavicular ligament though remains attached to the clavicle periosteal tube. The patient usually presents with pain on the superior part of the shoulder, especially if there is a history of fall on the shoulder or on an outstretched hand. There may also be the restricted motion of the shoulder. During the initial stage of the disorder, there may be generalized shoulder tenderness and swelling and specific tenderness develops at a certain point after the pain resolves. Pain may be aggravated when there is increased load on the shoulder. Many patients also tend to complain about sleep disturbance due to pain especially when sleeping on the affected side. Bruising may also be present. In type I and II injuries, the deformity is minimal and may not be present. In type III injuries, the distal clavicle (the part further from the neck) can be abnormally prominent. There is reduced range of motion and there is some pain when the patient tries to raise the affected arm. The diagnosis for a acromioclavicular joint injury can be achieved via patient history and examination of the patient. The grading of the injury can be made using radiological exams. Ultrasound and magnetic resonance imaging (MRI) re not widely used by may be employed to detect changes in the joint, assess the severity of the injury and determine the level of degenerative change. The aim of treatment for a acromioclavicular joint injury is to help the patient return to their level of function before the injury, with a pain-free and mobile shoulder. There are two parts of management; conservative and surgical management for AC joint injury. Conservative treatment is recommended for type I and type II injuries. Most commonly, the use of analgesics provides pain relief for the patient, ice packs can be applied and rest is recommended by putting the arm in a sling. A broad arm sling is recommended in these cases as it supports the shoulder and minimizes the sagging of the shoulder. Activities such as sports and lifting of heavy objects should be avoided for 8-12 weeks after injury. Approximately one-third of patients with type I and type II injuries continue to have pain on long term follow up with conservative management. Conservative management is also recommended for the initial management of type III injuries. It was found that with rehabilitation, patients return to the same strength and endurance as the uninjured shoulder. Surgical intervention is used to manage patients with type IV and type V injuries. Type VI injuries are very rare and almost all cases have been reported to be treated surgically. Patients will have an increased risk of having osteoarthritis in the future. For patients who needs surgery, there is also a chance for wound infection, weakness of the arm and other vague symptoms. It is important to evaluate the stage of injury once the diagnosis of AC joint injury is made as the management for each stage may differ. Rockwood CA Jr, Green DP, Bucholz RW, Heckman JD. Fracture in adults. 4th Philadelphia PA. Lippincott-Raven. 1996. Koehle SM. Patient education: acromioclavicular joint injury (shoulder separation) (beyond the basics). UpToDate. https://www.uptodate.com/contents/acromioclavicular-joint-injury-shoulder-separation-beyond-the-basics. Accessed 1/22/2017. Simovitch R, Brett S, Mehmet O, Kyle L, Warner JJP. Acromioclavicular joint injuries: diagnosis and management. Journal of the American Academy of Orthopaedic Surgeons. 2009; 17(4):207-219. Li X, Ma R, Bedi A, Dines DM, Altcheck DW, Dines JS. Management of acromioclavicular joint injuries. Journal of Bone and Joint Surgery American. 2014; 96(1):73-84. Fraser-Moodie JAF, Short NL, Robinson CM. Injuries to the acromioclavicular joint. Journal of Bone & Joint Surgery. 2008; 90(6):697-707. Mazzocca AD, Arciero RA, Bicos J. Evaluation and treatment of acromioclavicular joint injuries. The American Journal of Sports Medicine. 2007; 35(2):316-329.